The smell of a fresh box of crayons brings a flood of memories that might make you start to dance just like the happy supplies in this free pattern. And since embroidery is a bit like coloring with thread, stitching crayons seems like a good way to bring those things together. Vintage embroidery patterns often feature anthropomorphized foods and other items, and this pattern is designed in a similar style. Even the stylized arms and legs are reminiscent of vintage transfers. Do crayons really dance around when you're not looking? We may never know, but at least you can enjoy stitching them with or for a young friend. To access the Happy Crayons pattern, download the JPG file. Adjust the size within photo-editing software or using your printer's software. Print the pattern on regular paper and use your favorite transfer method or the one that will work best with the materials you're using. For a faster transfer process, try printing the pattern directly onto water-soluble stabilizer. Embroider the design with your favorite colors and stitches or follow the guide in the next image. Please note: This pattern is copyrighted by Mollie Johanson. You may use the design for personal projects and small batches of handmade items for sale. One of the fun things about a pattern with crayons is that you can stitch with any colors in the crayon box. In fact, when you go to buy new embroidery floss, there are even more colors than in a giant box of crayons, which is pretty great. It can also be daunting. 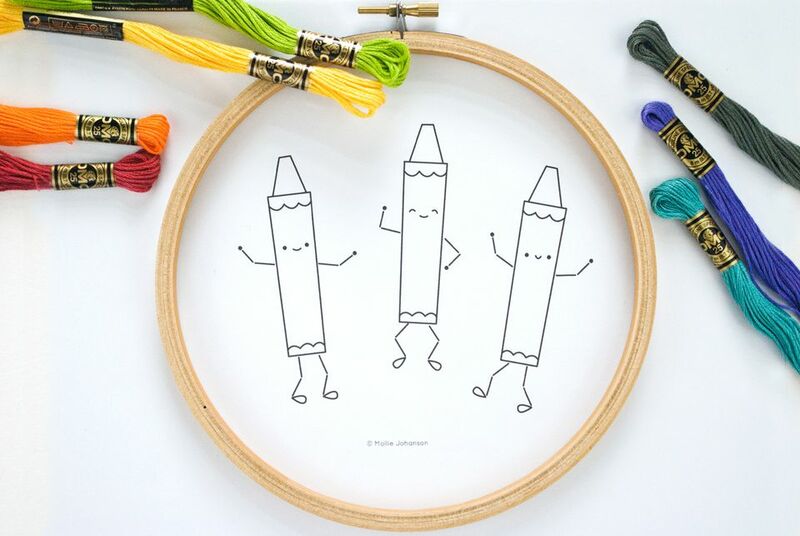 A good place to start with these crayons is to choose three shades of embroidery floss that are based on the primary colors: red, yellow and blue. The example above has some detailing in secondary colors. You might also choose hues that are based on different color schemes from a color wheel or even a few random favorites. You can use accent colors or the same main colors for the scalloped lines. Embroider the arms and legs with dark gray or black and use black for the faces. Simple stitches work well for this, but you can make it more complex if you want. Depending on how large you are stitching, you should choose stitches that won't result in overly thick lines, which would distort the design. The following stitches are only a suggestion to get you started. Use back stitch for the crayon outlines and straight stitch for the arms and legs. If the straight stitches are too long (because you're working at a larger size), use back stitch. Embroider the scalloped border, smiles and curved eyes with scallop stitch. This is worked similar to fly stitch, but working it loosely to form a curve and keeping the tacking stitch very small. Stitch the eyes and hands with french or colonial knots, and the feet with detached chain stitches. Because of the simplicity of the stitches, this pattern is good for beginners and perfect for giving young stitchers something to practice!